It’s been raining here in California; something much appreciated after three years of so little. Watching the drops dance on our patio, admiring our revamped back yard, I know it’s not yet the habitat we’d like it to be but a huge improvement over water-thirsty lawns. About a year ago we decided to tear out our lawns, front and back, and being cheap decided to tackle the job ourselves. Removing a lawn is one of those jobs for which the thinking about it is more intimidating than just jumping into the work. Jump in we did. Sprinkler heads were capped, a sod cutter rented to make quick work of cutting up the turf, which was then flipped, eventually turning the grass into compost. The bare dirt was shaped and graded with a shovel and rake and a lot of pondering during the process. Hummocks were formed and drip irrigation installed. With only an image of a favorite stream in my head, a faux creek bed was dug and rocks, stones and pebbles placed appropriately. Although I find it a bit distressing to remove one living plant in favor of another, the over-arching motivation was curbing water used for landscaping. Any new plants, trees or bushes would have to be California drought-tolerant natives. Research led us to the Bay Native Nursery; where a bounty of native plants is inauspiciously tucked between a mix of industrial buildings, open space and recreational shoreline in San Francisco’s India Basin. Faux creek bed and faux fish. During the first six months the currant grew from about a foot high to over five feet tall with a diameter nearly the same dimension. The salvias and blue-eyed grass blossomed. Since they were newly planted and the winter of 2015 was dry, the drip irrigation system was put to use, but only sparingly. Like it does for many California natives, the heat of late summer left the blooms withered and leaves brown. Except the currant; that plant is a juggernaut. Much of the plants’ growth came to a standstill from October through February and a stillness settled on the yard. Almost a year later, with enough rain to thoroughly soak the soil, the back yard is showing potential of becoming a habitat. The runners sent out by the salvias have emerged with stacks of gray-green leaves. Blue-eyed grass is blooming. Seedlings descended from the few poppies planted last spring have appeared. Their parents are forming flowers. It’ll be some time before our all-California native drought-resistant landscaping is finished but, for now, they blossom with hope. Sierra Currant (Ribes nevadense) bush. More blue-eyed grass showing how purple it is. Western Yarrow (Achillea millefolium californica), I believe. 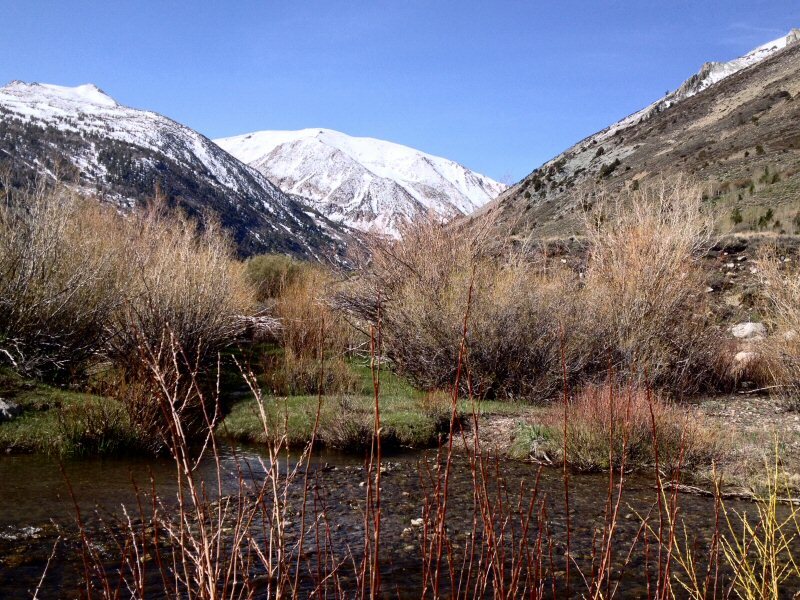 Categories: California Native Plants, Conservation, Drought, General Discourse | Tags: California, conservation, drought, outdoors, plants, weather | Permalink. 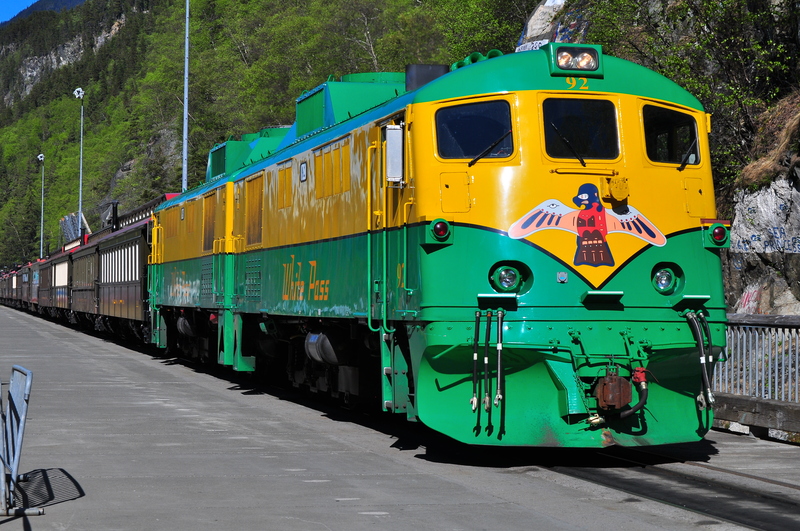 The second day of my Memorial Day trip was undecided until I rolled out of bed that morning. A lot of the time, my angling is a solo affair. 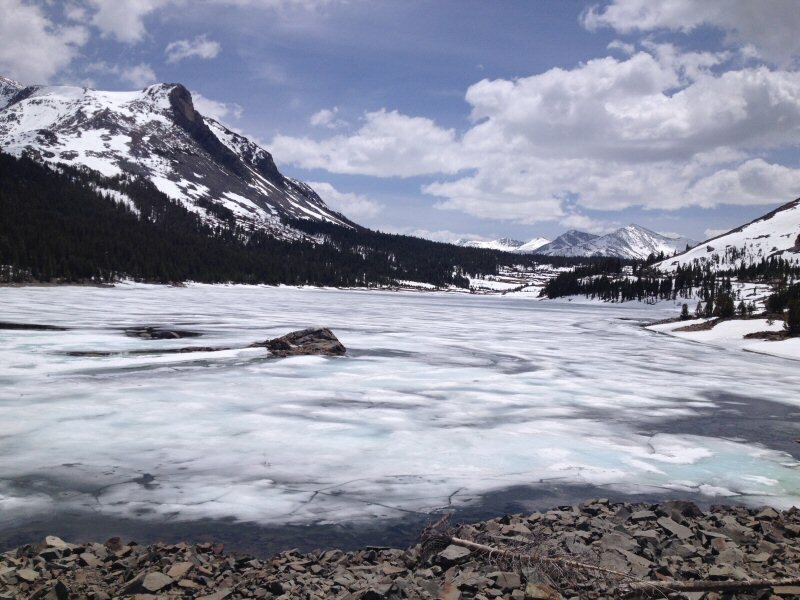 There was initial hope that Sean might join me — hitting the high country together is nearly an annual affair — but as happens with kids, they get jobs, take on other responsibilities and interests, and simply can’t always get away. Funny how that works: just as a parent gains a bit more freedom, children tend to lose theirs. A lack of soreness from the previous day’s hiking encouraged the consideration of another adventure, this time one that would harken back to the adventures of the younger me. 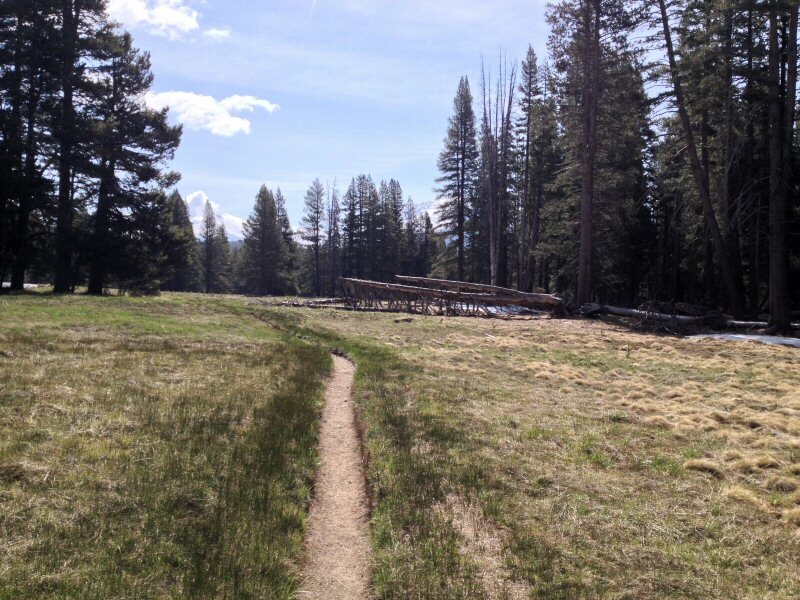 During the family vacations in Tuolumne Meadows, we’d often hear about the trail along the Lyell Fork of the Tuolumne River, but a trail I can’t recall ever hiking. Lingering was nice that morning, but the trail head was about two and a half hours away. I’m pretty practiced at whipping together a lunch and getting the gear ready. The previous day had shown that my Orvis day pack would serve me well, and with only one rod, the other rod pocket kept a water bottle handy. I was on the road about 7:00 a.m. That’s late for me, but today wasn’t to be rushed. Having traveled the route so many times, it could be said that I’m able to make the drive to Tuolumne Meadows with my eyes closed. But that would be a waste. Though I know what’s around that next corner, each visit offers a new revelation. 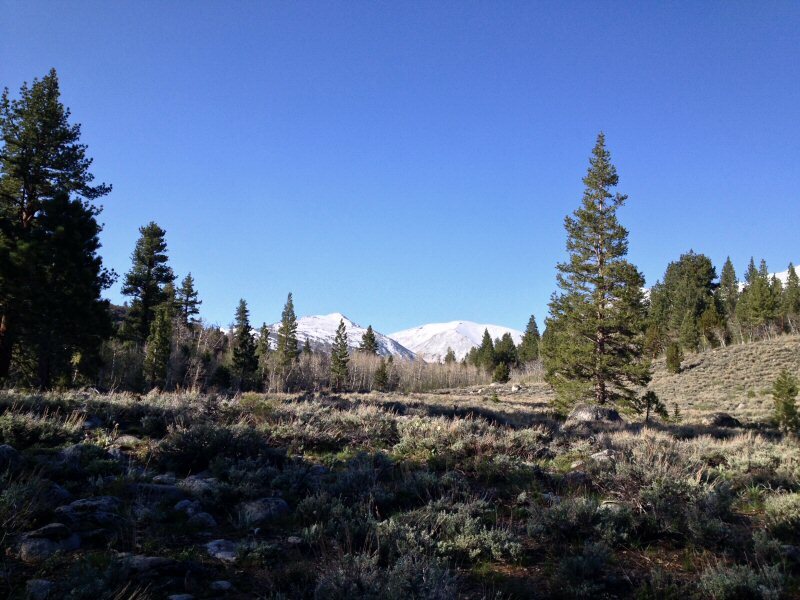 The Sierra Nevada was called the Range of Light by John Muir for a reason; every view changes, depending upon the season and time of day. The canyon where I stopped and turned around. 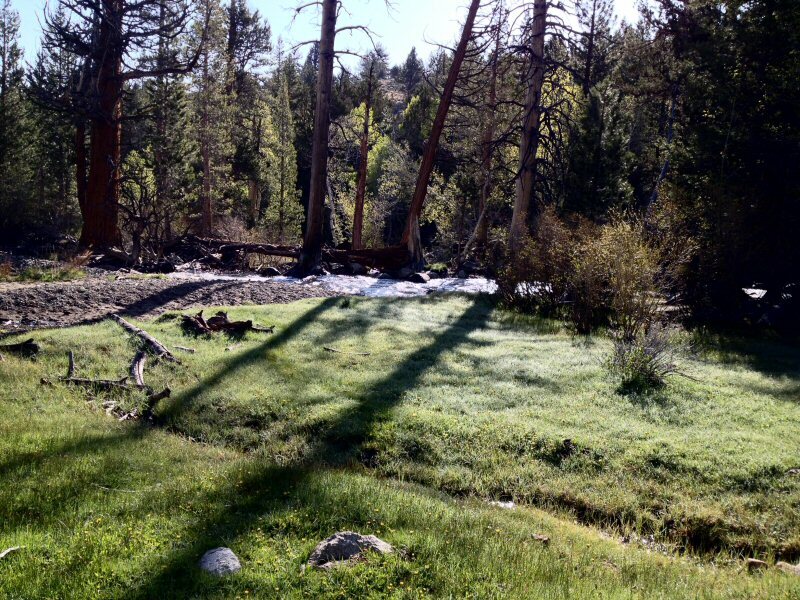 Memorial Day weekend marks the beginning of the camping season, but campsites in Tuolumne Meadows are usually still covered in snow or flooded by snowmelt. There was still traffic, mostly comprised of rock climbers itching for that first touch of that unique Sierra Nevada granite, and sprinkled with the usual sightseers passing through on their way to the valley. 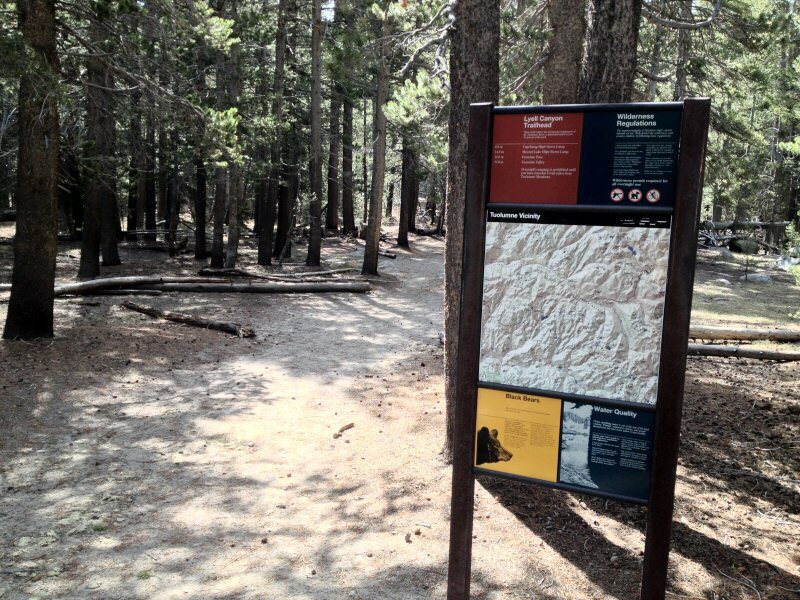 I pulled into the Tuolumne Meadows Wilderness Center just before ten. A line of hopeful backpackers wound around the building, but parking was easy to find. Pack secured and confirming I had the proper map, I hit the trail a few minutes later. 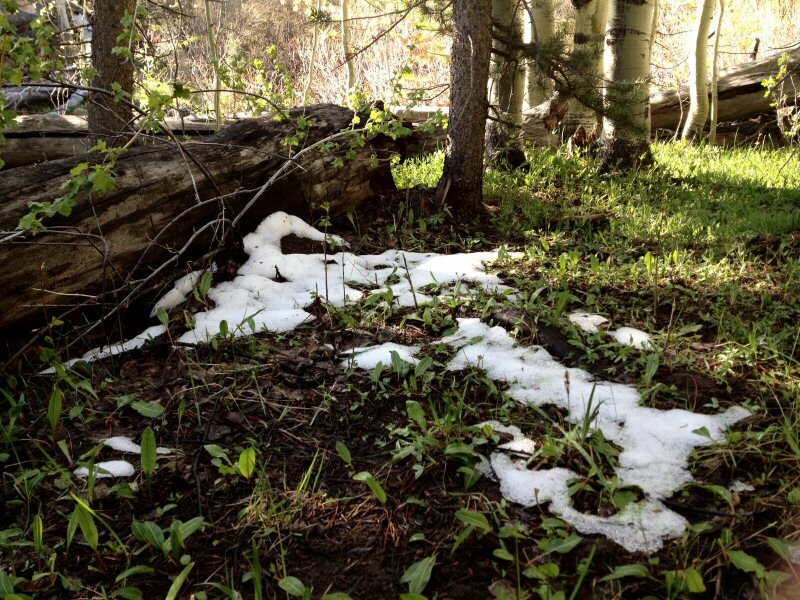 The trail was both familiar and unknown. 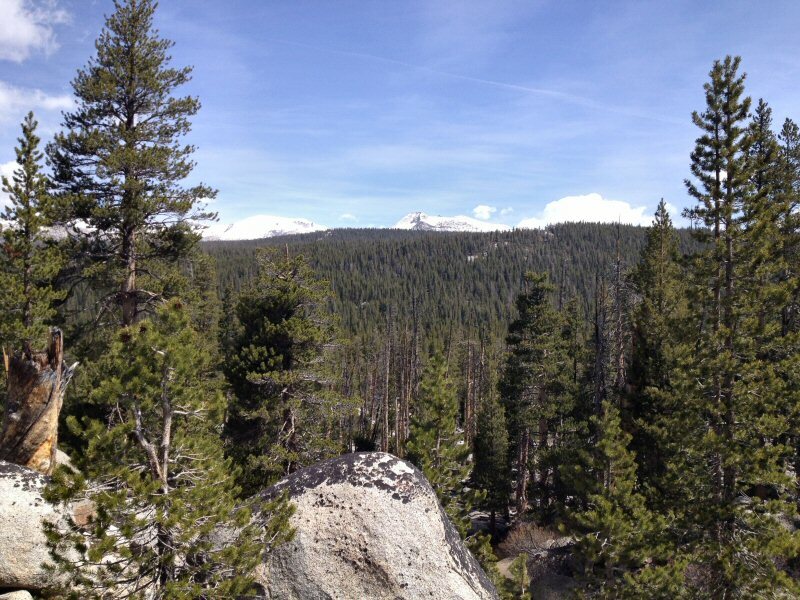 Many high Sierra trails must look the same at the onset. About a mile along, landmarks revealed this was new ground. 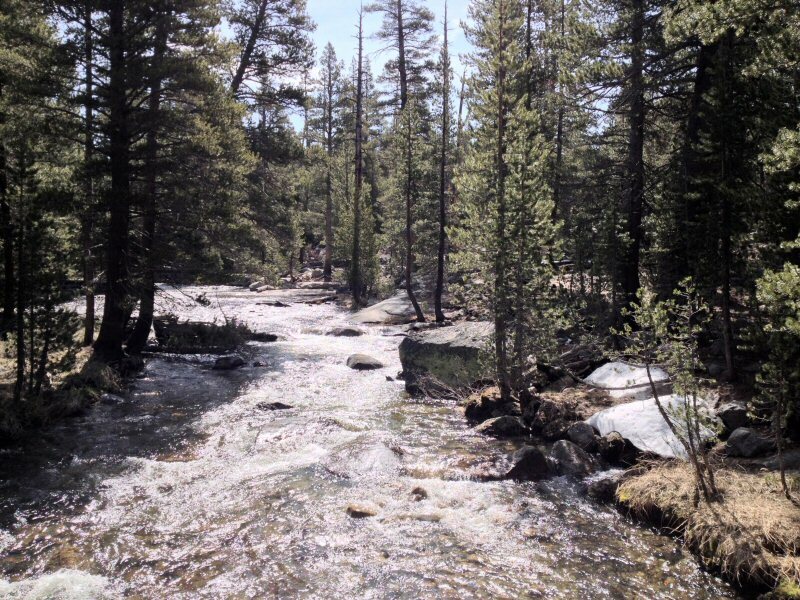 There were the rusted steel signs pointing to various destinations, the two bridges that lead to the opposite side of the Lyell Fork, and the river itself, meandering through meadows and twisting through and over the batholith that forms the core of the Sierra Nevada mountains. This is the type of country that refreshes the soul. Another view, looking down river. After a mile, I was alone on the trail. The hike was easier than expected. I was inclined to chalk that up to hard-won improvements in my physical fitness — particularly with a trailhead elevation of 8,600 feet — but later determined that the elevation gain was less than 500 feet. Roughly two miles in I left the trail to follow the course of the river. It wasn’t easy. 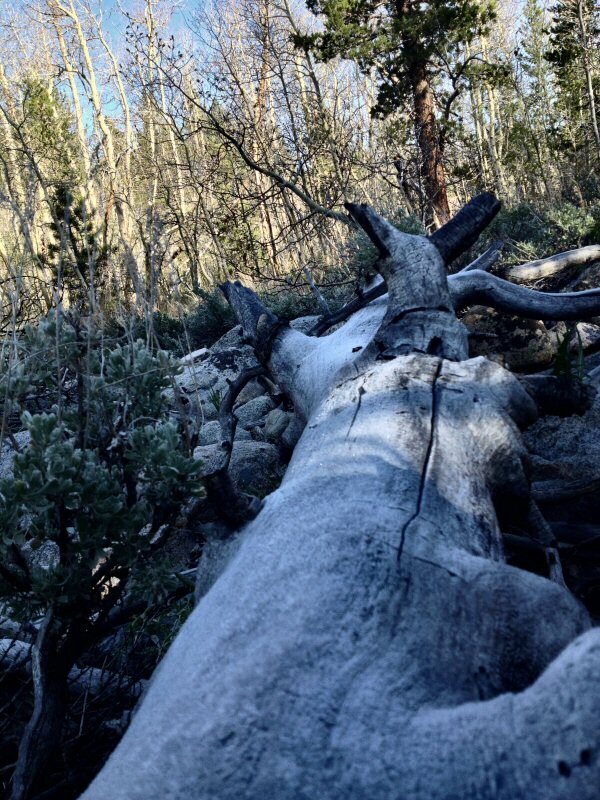 Down trees, boulders and the Lyell’s long elbows required numerous detours. About four miles along I came to a narrow canyon. Continuing up river would require a long detour. But I had started a bit late, and daylight can be precious when in the wild. I rigged up the 3 wt. rod and began that slow walk downstream, presenting my fly to suspect water. The river was high, limiting where a cast could be made without immediate drag. This is the type of country and the type of fish where stealth pays off. I spooked fish with every step. Where possible, I’d cast four or five feet from the bank, with only a few rises to show for it. 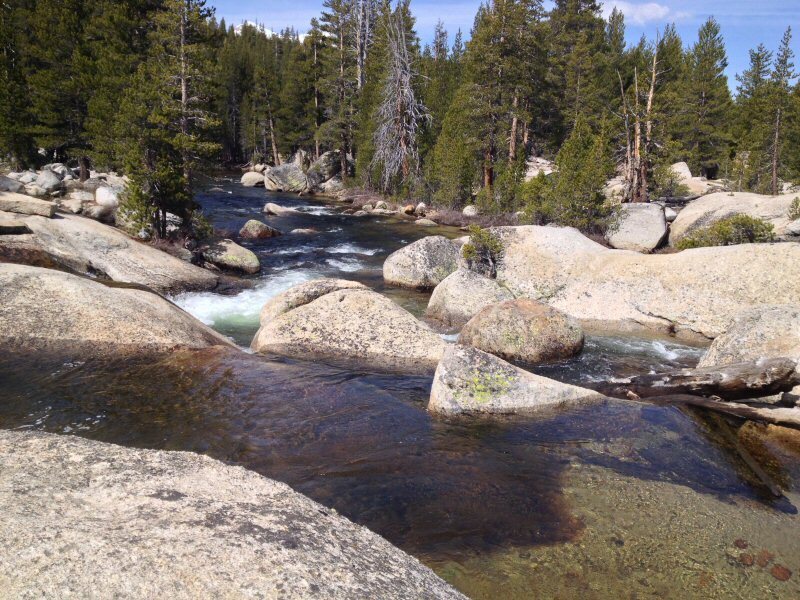 The course of many high Sierra rivers is dictated by huge granite outcroppings, creating pools. In midsummer these pools attract swimmers, but this early in the season it was still too cold for such nonsense. I found one such monolith that directed the Lyell Fork almost ninety degrees from its course, creating a deep pool that offered a feeding lane and overhead protection. 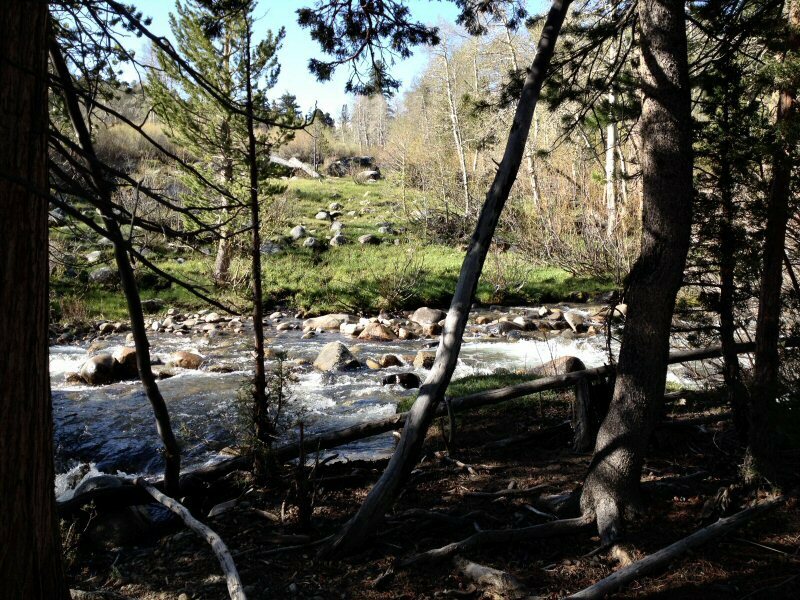 Up against the granite was slack water, from which decent sized brook trout would intermittently rocket to the surface. I tend to avoid putting myself in position to hook a fish without an easy way to bring them to the net. A fishless morning, however, changed my outlook. 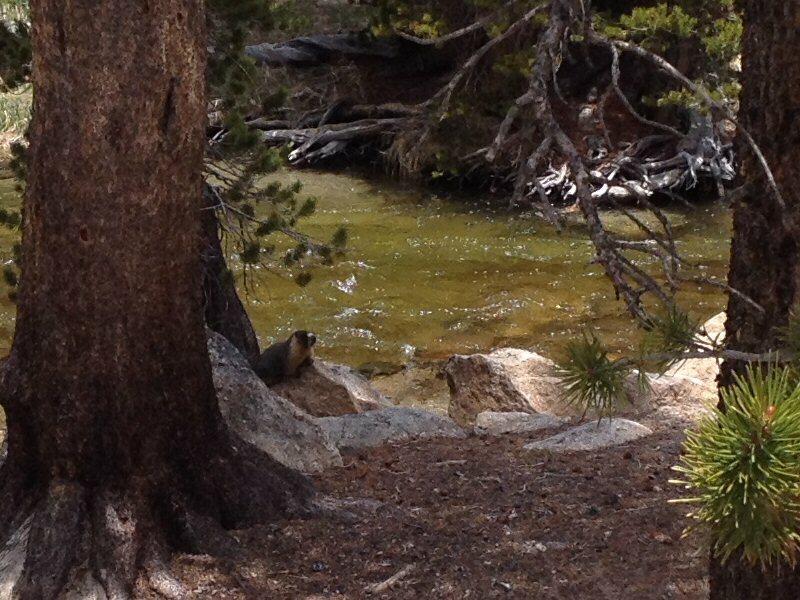 Moving away from the water and giving the fish a wide berth, I quietly and slowly crept to the top of the outcropping. Carefully peeking over the edge, I could see about half a dozen trout about fifteen feet below. Counting on the height to conceal any false casts, I laid a stimulator in the seam that would funnel insects to the trout. A fish rose, inspected my fly, and dismissed it. That was the pattern on subsequent casts. Offering a break for both myself and the fish, I sat down to tie on an Elk Hair Caddis. That’s all it took. A nice-sized brook trout nailed it and went wild. It jumped like a rainbow and shook its head like a salmon. My excitement began to change to panic with the realization that there was about twenty feet of line between me and the fish and that I had to lead it thirty feet to my right if there was any hope of getting it to the net. It was a thrilling fight for all of about forty seconds, and I did get a good look at what could’ve been about twelve inches of healthy Salvelinus fontinalis before a not-so-long distance release. The tug of that fish — and the fact that I once again was able to fool a wild fish (an accomplishment that continues to amaze me) — made the day seem brighter. 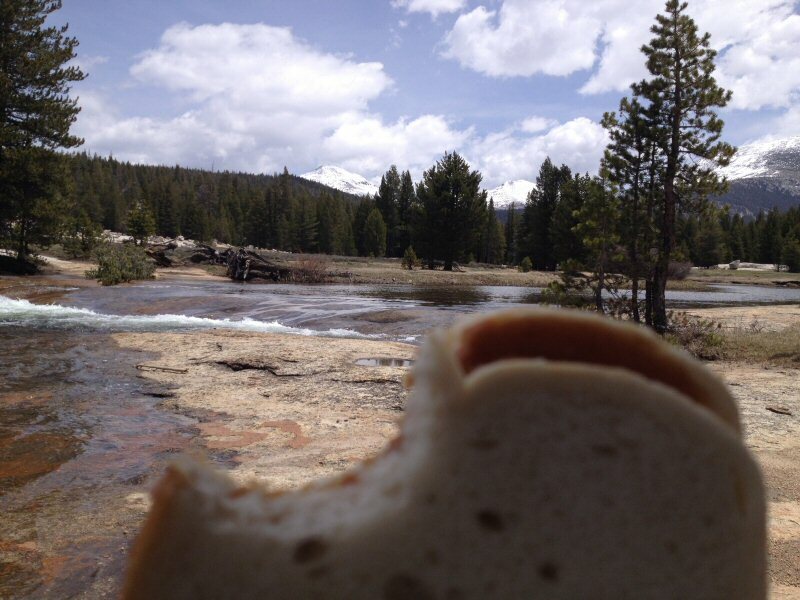 I wandered downstream a bit, trying to sneak up on fish in the meadows, and after a few hits but nothing solid, I sat down in the world’s best dining room for a peanut butter and jelly sandwich. 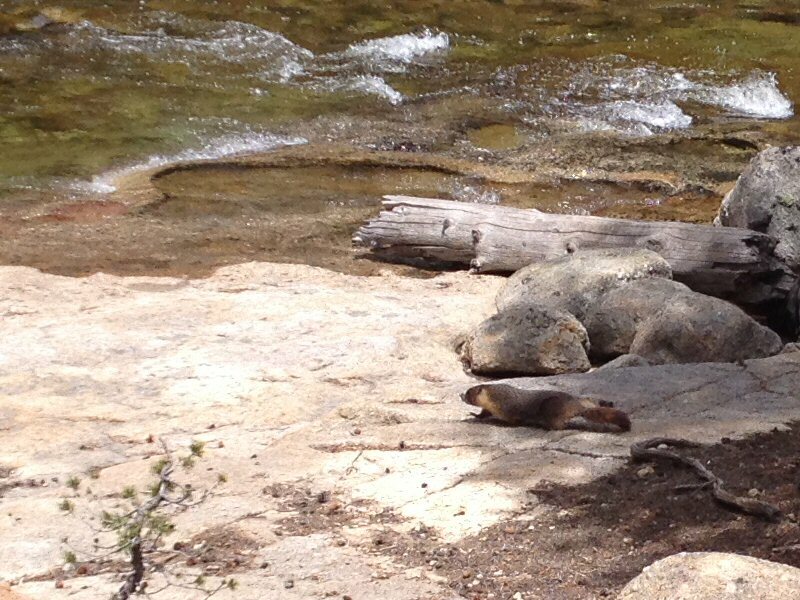 I met more people on the hike out, followed a marmot for a few hundred yards and lingered here and there. It was another day of personal accomplishment. No knee brace was required and my breathing wasn’t labored like it was last year. Now, I hope to get back when the water’s lower and the fish hungrier. The beginning of my hike. 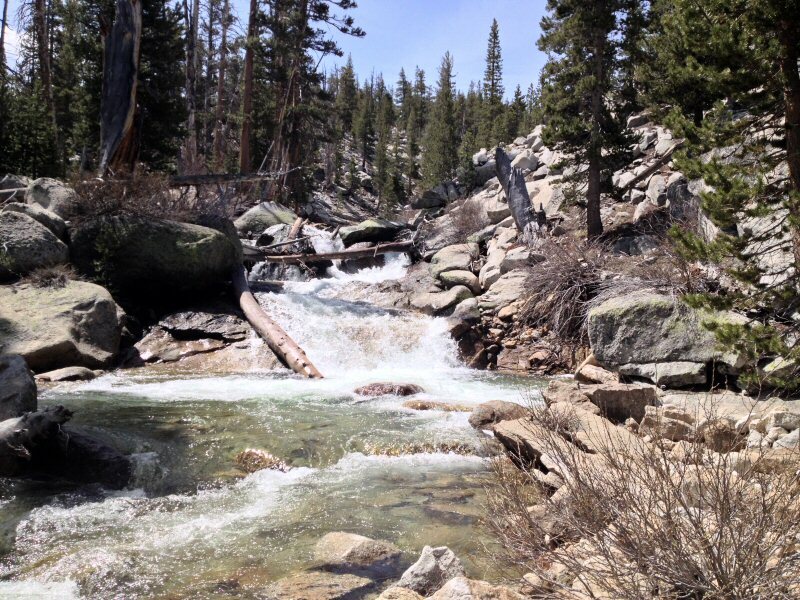 On the John Muir Trail following the Lyell Fork of the Tuolumne River. 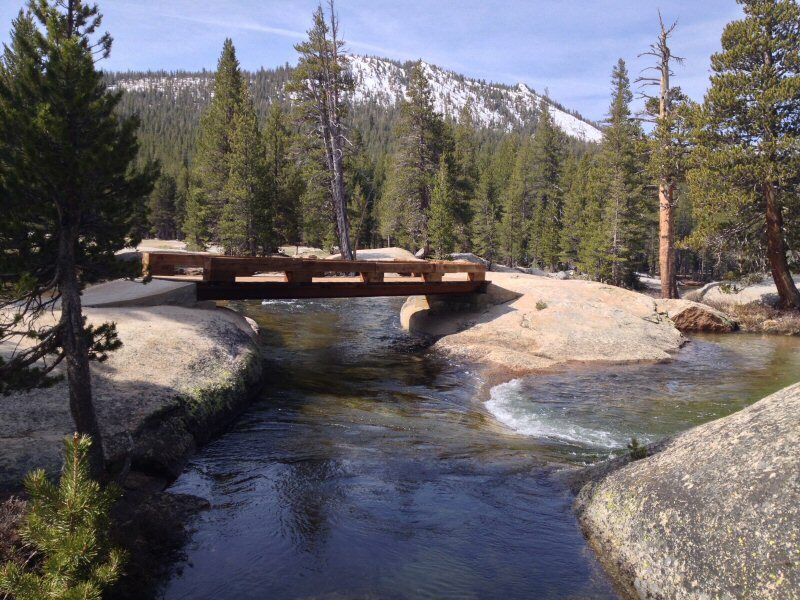 The Dana Fork of the Tuolumne River, I believe. The hike really begins. I was alone. 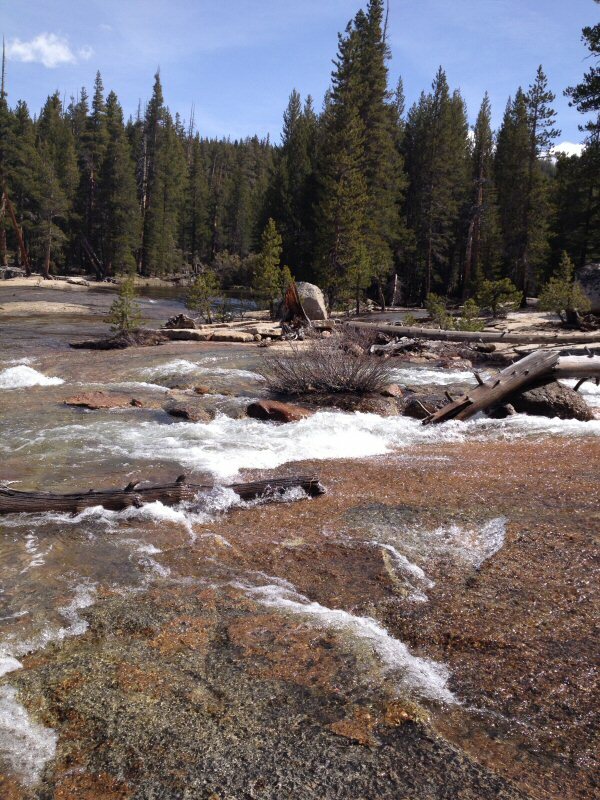 Rapids on the Lyell Fork. The view, looking roughly northwest, from the mouth of the canyon, where I turned around. The best dining room for a PB&J. Categories: Brook Trout, California, Fish, Fishing, Fly Fishing, Hiking, Sierra Nevada, Trout, Tuolumne Meadows, Tuolumne River, Vacation & Travel, Wild Trout, Yosemite | Tags: brook trout, California, catch and release, fishing, fly fishing, High Sierra, hiking, Lyell Fork, outdoors, Sierra Nevada, trout, Tuolumne Meadows, Tuolumne River, wild trout | Permalink.